11.1V 4200mAH Lipo battery is Capable of maximum continuous discharge rates up to 35C, placing this battery among the most powerful Li-Po battery packs in its class! It offers an excellent blend of weight, power and performance. 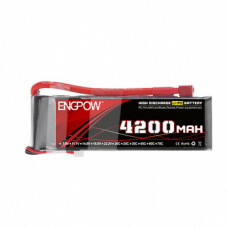 Charge Capacity( C ) : 4200mAh. High energy density - potential for yet higher capacities. Relatively low self-discharge - self-discharge is less than half that of nickel-based batteries. Low Maintenance - no periodic discharge is needed; there is no memory. Specialty cells can provide very high current to applications such as power tools. It is applicable from indoor slow flyer to large-scale sport and aerobatic airplane models, as well as micro to mid-sized helicopter models.